Have a hard time eating breakfast? Make your morning meal in a Mason jar for easy eating on-the-go (and minimal cleanup). What’s stopping you from eating breakfast? Some people self-identify as never having been a “breakfast eater,” often after years of skipping breakfast due to logistics. Maybe you’re rushing to get kids out the door to school. Maybe you have a hard time slotting in a meal before or after your morning commute. Maybe chronically hitting the snooze button turns the morning into chaos. Maybe you’re sacrificing a morning meal in favor of fitting in physical activity. Having meal options that are both portable and plan-ahead can be critical to making breakfast happen, and can even make that breakfast a more nutritious start to the day than a pastry or granola bar. Enter the Mason jar. Mason jars may be a hipper-than-thou favorite of food bloggers showing off layered salads and trendy restaurants serving beverages, but they’re also a handy, microwave-safe container for a tasty breakfast. They’re inexpensive and easily replaceable, with a classic utilitarian nature that will long outlive any trends. When using the jars as meal or storage containers, I recommend buying the plastic screw-top lids, rather than the two-piece metal lids used for canning. Although edicts that you should eat within 30 minutes of waking are a little overblown — in other words, not based on any solid research — eating your first meal of the day while it’s still morning is a universally good idea. That’s largely because your body has been fasting all night and needs refueling, but also because skipping breakfast shifts more calories to later in the day. For some, skipping breakfast can lead to becoming overly hungry at lunch — resulting in overeating — and even if that’s not the case, when more of our food intake happens later in the day, it can disrupt our circadian rhythms (internal clocks); emerging research suggests that isn’t good for health. These three Mason jar breakfasts are a big step up from grabbing coffee and a yogurt on your way out the door. Even if you have time to eat breakfast at home, they can streamline your morning routine — and you’ll only have a single jar to wash. The important thing to remember about this recipe is the 1:1:1 ratio: one part dry rolled oats to one part yogurt to one part liquid. How big the “parts” are will depend on morning appetite. The proportions below are a good starting point. You can omit the pumpkin and play around with your favorite combination of nuts and dried, frozen or fresh fruit. Most people eat overnight oatmeal cold, or closer to room temperature, but you can also briefly heat it in the microwave. 1. Combine rolled oats, yogurt, milk and pumpkin in a 16-ounce wide-mouthed Mason jar. Stir to combine, making sure that the oats get evenly distributed. 2. Add the dried cranberries, pecans and spice and stir again (if using fresh or frozen fruit, layer it on top until you are ready to eat — the frozen fruit will gently thaw). Screw on the lid and refrigerate until ready to transport, or eat. This recipe can be totally modified to suit your tastes. For example, if you like Mediterranean flavors, swap in feta cheese, halved cherry tomatoes and kalamata olives. 1. To a 16-ounce wide-mouthed Mason jar, add all ingredients, eggs through pepper. Screw on a plastic lid. Refrigerate if prepping the night before. 2. When ready to cook, shake the mixture until it’s well blended. Remove lid and microwave on high until the omelet rises to about 2 inches from the top of the jar and the eggs look mostly set, about 2 minutes. Let the omelet rest for 5 minutes. 3. Carefully remove from the microwave (the jar will be hot). Garnish with additional cilantro if desired. 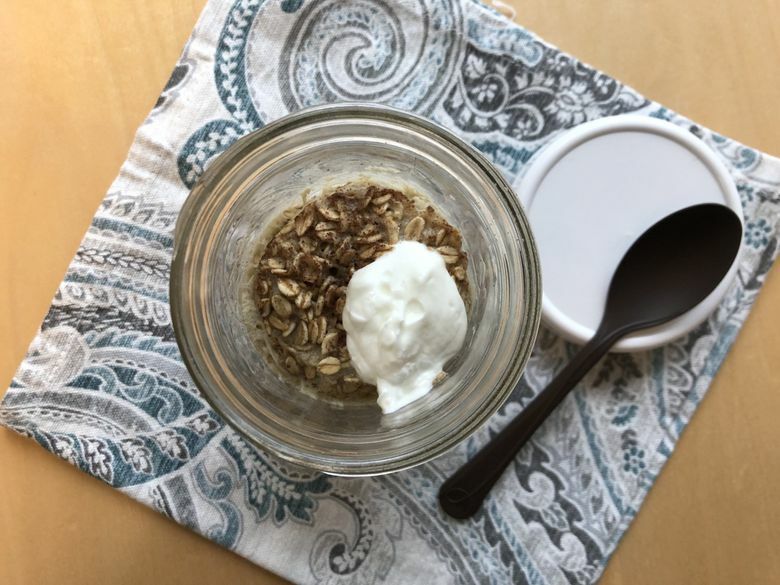 This recipe provides a little extra protein to your morning oatmeal, thanks to the egg and Greek yogurt. This may be especially useful if you love oatmeal but find that it doesn’t keep you satisfied for very long. The version below uses dried fruit, which for most people is a pantry staple, but you could also use a ¼ cup diced apples or fresh berries. 1. In a 16-ounce wide-mouth Mason jar, add the egg and milk and whisk with a fork to blend. Stir in the next five ingredients (oats through salt). 2. Microwave on high until the egg is set and the liquid is absorbed, about 2 minutes. 3. Carefully remove from the microwave (the jar will be hot), stir and top with the yogurt.